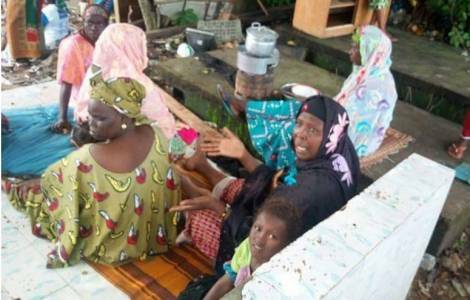 AFRICA/IVORY COAST - Families forced to live in cemeteries, "a sign of human and political decadence"
Abidjan (Agenzia Fides) - The violent rains that have struck the country and caused the death of dozens of people (see Fides 21/6/2018) have fueled the deterioration of the health conditions of the affected populations. As a result of these catastrophic events the Ivorian government has decided to demolish the homes of the most precarious neighborhoods where the poorest families live. As a result of this political action, these families no longer know where to look for a roof: the only shelter they found is in the cemeteries, there they sleep on the graves. "These are images that challenge human understanding; they are the expression of human and political decadence. Families, women, children, today victims of the cruelty of a political system in which man and his dignity have no place", says Father Donald Zagore, an Ivorian theologian of the Society of African Missions, to Agenzia Fides. "Can we really talk about development when the human being is reduced to an animal state? This is a development policy with an inhuman face, without a heart", underlines Zagore who in these days is in Rome for a meeting of the Episcopal Conferences of Africa and Madagascar (SECAM). "Never in the last twenty years - he continues - the history of the Ivory Coast has been written with so much pain, so much suffering, so much injustice and so much wickedness. Refused by men, welcomed by the dead. This is the reality of so many poor people who are rejected and driven away by other living beings and who now finds refuge only among the graves. In fact, the dead in their graves show the humanity which is lacking and give a lesson to those who have become increasingly insensitive to dignity".